This weekend saw the semi-finals of the Norfolk Ladies League Plate competition taking place. An all Division One line-up. 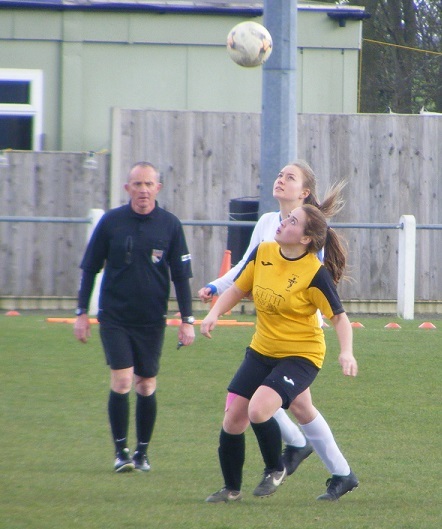 Beccles Town Ladies reaching the last 4 of the competition were looking to reach their first ever cup final as they travelled to play Aylsham Ladies in their semi-final. A disappointing 2nd half to the campaign for Aylsham who showed early promise upon their return to women’s football this season 2nd for a long spell played out their last league match in midweek a 4-2 loss seeing them finish 5th. A shot at ending the season on a high by reaching the League Plate final. Megan Vincent on target with a goal for Beccles giving them a narrow lead at half-time. Onto the 2nd half and Vincent struck again to double Beccles lead and see them into their first ever final in just their 2nd season. 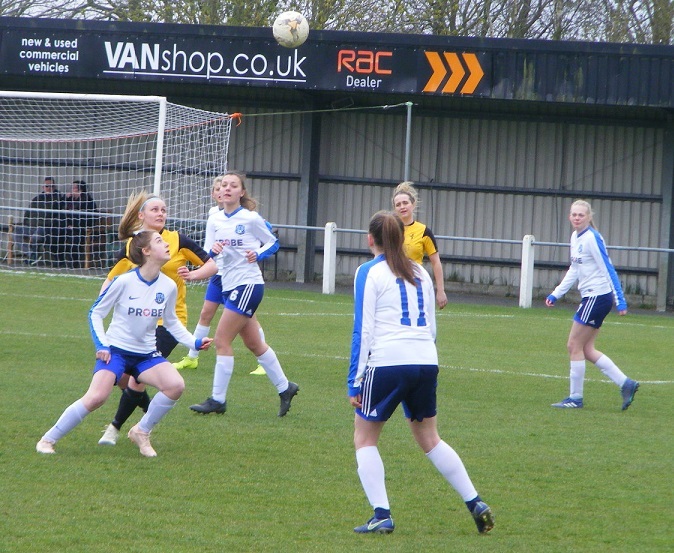 Their opponents in the League Plate Final will be Sprowston Athletic Ladies who will be making their third successive appearance on a Norfolk Women’s Finals day in their various guises. Their debut as Sprowston Athletic were at home to Wymondham Town Ladies Reserves in the last 4. Katie Fray netting a brace along with a gal for Olivia Leggett securing a 3-1 win for Sprowston Athletic, Laura Watson on the scoresheet for Wymondham. One game played in Norfolk Women’s Division One this Sunday just a handful of matches left to play, Thorpe United Ladies Champions have played all their games. this weekend it was the last league game of the season for Sprowston Ladies, into the final of the Ladies League Cup the 2nd placed side were away to Bungay Town Ladies who picked up the 3 points with a midweek home win over Aylsham Ladies on Wednesday. A 4-2 win, Imogen McGregor netting a brace with a goal each to for Jody Wells & Selina Rowland. Were looking to build on that result at home to Sprowston the scores level at 1 a piece at half-time more of the same 2nd half with both adding another goal to share the points in a 2-2 draw. McGregor scoring both the goals for Bungay the youngster into double figures now for the season. Victoria Leyer on the scoresheet for Sprowston once again with her 28th of the season with Abbi Nobbs also getting a goal. Sprowston finishing on 23 points 2 clear of Gorleston Ladies who still have two games to play. Taverham United Women remain in a strong position at the top of Norfolk Women’s Division Two. Their lead 9 points bouncing back well from their 1st league defeat of the season against Tavern ladies two weeks ago. At home this Sunday were taking on Bure Valley Wildcats Ladies. Taverham are scoring plenty of goals well past 100 now, 36 of those claimed by Rebecca Sutton the clubs top scorers on target with another goal this Sunday. Goals to for Charlotte Hurren her 9th of the campaign and Teigan Robinson with her 12th of the season Taverham winning 3-0. A big week coming up with a trip to Long Stratton Women now 2nd on Wednesday and Clipbush Park on Sunday to play 3rd placed Fakenham Town Ladies. Those two met this weekend with Fakenham 2nd going into the match travelling to Long Stratton. The hosts taking a 1-0 lad into the break with Emily Watts finding the back of the net. Watts adding a further 2 goals in the 2nd half to claim her hat-trick and in doing so moving onto 25 goals for the season. Long Stratton winning the game 3-0 and moving above Fakenham losing for just the 2nd time in the league into 2nd spot. Tavern Ladies fourth in Division Two were playing at home on Sunday against bottom side Bulldogs Ladies. The Dereham based side are scoring plenty of goals this season, largely through Katie Hart-Copsey who has more than half their tally moving past 40 goals for the season, sporting a new pair of boots at the weekend they brought her a further 4 goals to take her to 45 goals, Tavern leading 4-1 at half-time went on to win the game 7-2. Nicole Costin scoring a brace for Tavern their was also a 21st goal of the season for Atlanta Griffith. Emily Hinsley making just her 3rd appearance for Bulldogs scoring both goals her first for the club. 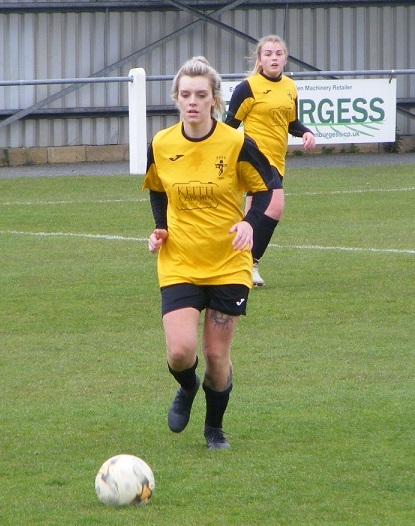 Both Zoe Waite and Abigail Bell were celebrating a hat-trick at the weekend for Gorleston Rangers Ladies as they won 8-1 away from home against Horsford Women to move back up into 6th position in the Division Two table. Rachel Adams also on the scoresheet for Gorleston with her 13th goal of the season with Amy Durdin celebrating her 1st goal of the campaign. Laura Hudson with the 43rd minute goal fr Horsford. Hockering Ladies have done fantastically well to battle on this season more often than not struggling to field a full team, it was a rare occasion this Sunday when the boot was on the other foot, Hockering having not only a full side but someone on the bench. Were at home taking on Thetford Town Ladies who were the ones short on numbers this Sunday with just 8 available. Hockering able to take advantage a get just their 2nd win of the season. Jolene Ayrton opening the scoring in the 7th minute went on to score a first half brace her first goals for Hockering 2-0 up at half-time Leah Brown was on target from a brace too in the 2nd half. Laura Stratton making her 2nd Hockering appearance scoring her 1st goal too along with Sophie Baldry celebrating her 1st Hockering goal in just her 3rd appearance. A 6-0 win for Hockering. This entry was posted in Norfolk Ladies Plate, Norfolk Women's Division One, Norfolk Women's Division Two, The Round-Up and tagged Norfolk Ladies League Plate, Norfolk Women's Division One, Norfolk Women's Division Two, The Round-Up on April 10, 2019 by WFEast. A reduced fixture list across the county leagues in the East this weekend, Sunday being Mother’s Day just 15 games played across the whole of the region felt it easiest to place all the games in one edition of The Round-Up. A handful of games in Norfolk, Suffolk, Essex & Beds & Herts. Beginning in Norfolk, two matches played in Division One on Sunday. League Champions, Thorpe United Ladies playing their last game of the campaign away to Bungay Town Ladies. 12 wins and a single defeat in the 13 games played to date a successful league campaign for Thorpe bringing a number of youth players into the squad this season, have performed well the club running away with the leagues, injuries stretching them towards the end were looking to end on a high against a Bungay side starting to move in the right direction themselves after a difficult start to the season. Always competitive between the two a heavy defeat for Thorpe at Bungay last season, a better start to the game scoring twice to lead the game 2-0 at half-time. A competitive 2nd half saw Bungay fight back scoring 3 goals, Thorpe responding adding a further two goals to win the game 4-3. Captain Rebekah Lake finishing well clear as top scorer for Thorpe a goal on Sunday taking her to 18. Midfielder Laura Hedtke also into double figures for the season with a goal finishes on 11. Victoria McNorton and Millie Cursons also on the scoresheet. Selina Rowland, Grace Storey and Jody Wells getting the Bungay goals. Gorleston Ladies up to 3rd in the Division One table have 2nd placed Sprowston Ladies in their sights, were at home this Sunday taking on 4th placed Sprowston Athletic Ladies. A close game a goal each for Sophie Gillett and Bethany Turner enough to win the game for Gorleston despite a goal from Kate Morris for Sprowston Athletic the hosts winning 2-1 move to within a point of Sprowston Ladies with a game in hand. 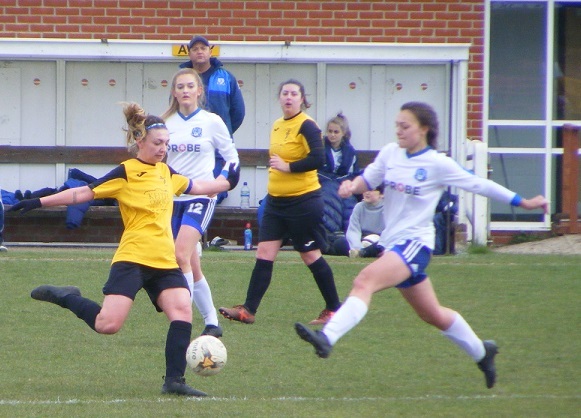 A first defeat in the league in women’s football for Norfolk Women’s Division Two leaders, Taverham United Women last Sunday losing 3-0 at home to in form Tavern Ladies. Taverham bouncing back straight away with an away win against bottom side Bulldogs Ladies this Sunday in the only match taking place in the division. The scores close at half-time with Taverham holding a narrow 1-0 advantage. The visitors getting the better of the 2nd half despite Bulldogs getting a goal themselves Taverham going on to score 3 more to win the game 4-1 to go 9 points clear at the top of the table, Hannah Artis bagging herself a hat-trick in the game along with a goal for top scorer Rebecca Sutton who now has 35 goals for the season. Three league games played in the Suffolk Women’s Division this Sunday, East Bergholt United Ladies keeping their 6 point lead at the top of the table with a home win in a high scoring match with 3rd placed Brantham Athletic Ladies. The visitors scoring 3 goals, East Bergholt securing the 3 points hitting five in reply. Stacey Teager scoring a brace to move to 16 goals for the season. Another goal for Annie Northwood takes her to 33 for the campaign. Jessica Clark and Jessica Quinsee also scoring a goal a piece. 2nd placed Needham Market Women awarded the 3 points for a home win against Alresford Colne Rangers. Brettvale Ladies keep up their good form in 2019 just the one defeat from 8 played. A point earned on the road this Sunday away to Leiston St Margaret Ladies. Pushing for a decent mid-table finish and a good platform to build on for next season. Tarnya McKew scoring her 18th goal for Brettvale since joining the game finishing 1-1. A winning end to the season for Brightlingsea Regent Ladies, their first season in women’s football coming to an end at home to Chantry Grasshoppers Ladies. The team continuing to develop haven’t always got the points they deserved, looking for a new manager to take their development further. 1-0 up at half-time Brightlingsea made sure of a winning finish adding a further 2 goals 2nd half to win the game 3-1. Paige Knight, Jessica Scott and Lucy Tilbury with her 1st of the season the goalscorers. Felicia Harris with her first Chantry Grasshoppers goal. Two games in the Essex Women’s Premier Division this Sunday. League Cup action or lack of seeing Harlow Town Ladies lose ground in the league a comfortable victory at home on this weekend saw them climb back up to 3rd in the table. Were taking on Silver End United Ladies, 2-0 up at half-time, Harlow scoring a further 2 in the 2nd period to clinch the 3 points. Top scorer Hannah Smith amongst the goals with her 23rd of the season, 17 goals too now for Ellie Nicholls also getting a goal. Lucy Edmeades with a goal too with Ellie Wallace another new name amongst the goal scorers for Harlow this season with her first goal in just her 2nd appearance. In the other game played on Sunday in the Essex Women’s Premier Division it was a 7 goal thriller between Corringham Cosmos and Southend United Ladies. Rebecca Gallagher getting hosts Corringham off to a great start scoring her 17th goal of the season in the opening minute. Southend getting back on level terms to see the sides drawing 1-1 at half-time. The visitors getting the better of the 2nd half a further 5 goals added to win the game 4-3. Michelle Sumpter on the hour and final minute for Corringham. Lily Halliday, Ria Toovey, Kate Wiseman and Lauren Johnson with the goals for Southend. One game taking place in Essex Women’s Division One on Sunday with Chigwell Ladies at home to 4th placed Rayleigh Town Ladies. 46 goals now for Rayleigh Town captain Isabelle Wallings scoring a brace against Chigwell. Was Sunday’s top scorer however with a hat-trick for Holly Gash who herself moves onto 22 goals for the season. Millie Arnold also on the scoresheet with a goal along with Sophie Rhodes scoring on her Rayleigh Town debut in a 7-0 victory. The top sides bunch up again in Beds & Herts Women’s Division One with leaders Northwood Ladies not in action the chasing sides all picked up the 3 points to see just 4 points once again between the top 4. 3rd placed Hemel Hempstead Town Ladies awarded the home win over Sharnbrook, there were two matches played on Sunday. 2nd placed St Albans Ladies closing to within a point of Northwood winning away to bottom side, Garston Ladies 2nd XI. A fantastic start for the visitors 2-0 up inside the opening 6 minutes. Michaela Johnson making it 1-0 with less than a minute played, Molly Slade doubling the lead. Garston doing well to keep St Albans adding further goals, just 3 minutes left on the clock, St Albans doing 3-0 up, Slade with her 2nd of the match in the 87th minute, a 4th goal added in the final minute with Ellen Salter finding the back of the net for her 15th goal of the season. A closer score for 4th placed Welwyn Pegasus Sapphires away to Sherrardswood Ladies on Sunday winning the 3 points with a 2-1 result to keep them right up with the league leaders in Division One. 4 points from their remaining 2 league games will see Hitchin Belles win the Beds & Herts Division Two title. Move 7 points clear at the top with a comfortable home win over Evergreen Eagles on Sunday. 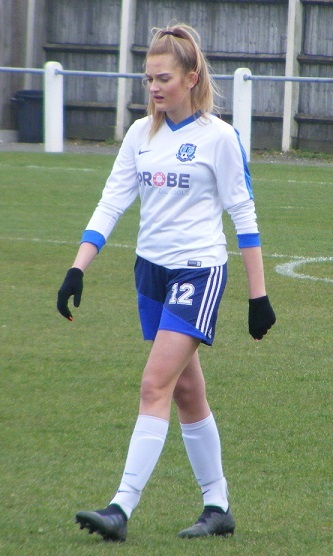 Top scorer Katie White netting a hat-trick moves to 21 goals for the season. Amy Jack back amongst the goals with a brace to go to 18. With a brace to for Kiera How enjoying a good run in front of goal with 14 goals now for the season. Hitchin Belles winning the game 7-1. Sophie Kempsford on the scoresheet for Evergreen Eagles. Hitchin Town Ladies the side that can catch them with games in hand. Hitchin Belles last game of the season away to their local rivals. 2nd placed Letchworth Garden City Eagles ow title hopes dashed on Sunday as they lost away to 5th placed Evergreen Ladies on Sunday. Captain Rebecca Freeman scoring twice as Evergreen continued their recent good form with a 4th straight league win to put them to within a point of 4th placed Royston Town Ladies Development with a game in hand. Two games too in Beds & Herts Women’s Division Three this Sunday. With leaders AFC Dunstable Ladies Development not in action it was an opportunity for 2nd placed Woburn & Wavendon Lionesses to close the gap at the top back to 4 points. Were away to Stotfold Juniors Ladies. Giselle Randall continuing her excellent season in front of goal for the visitors scoring a hat-trick to take her onto 24 goals for the season. The winning score 4-0 with Kodi Meader also on the scoresheet with her 1st of the season. In the other game was 3rd versus 4th with Langford Ladies away to AFC Kempston Town & Bedford College Ladies. A tight game between the sides goalless at half-time a single goal enough to win the points in the 2nd half, Kayleigh Humphries getting the goal the win taking Kempston Town & Bedford College back above Langford into 3rd place. This entry was posted in Beds & Herts Women's Division One, Beds & Herts Women's Division Three, Beds & Herts Women's Division Two, Essex Women's Division One, Essex Women's Premier Division, Norfolk Women's Division One, Norfolk Women's Division Two, Suffolk Women's Division, The Round-Up and tagged Beds and Herts Women's Division One, Beds and Herts Women's Division Three, Beds and Herts Women's Division Two, Essex Women's Division One, Essex Women's Premier Division, Norfolk Women's Division One, Norfolk Women's Division Two, Suffolk Women's Division, The Round-Up on April 3, 2019 by WFEast. The games starting to run out in Norfolk Women’s Division One with a handful of fixtures left to play, the league title decided already Thorpe United Ladies leading from start to finish. Runners-up spot isn’t quite done an dusted yet Sprowston Ladies have it right now with one game left to play. Two fixtures from the division this weekend and a good result at home for 3rd placed Gorleston Ladies sees them close the gap. Gorleston were at home taking on Aylsham Ladies who haven’t won in the league in 2019 following a great 1st half to the season. Gorleston finding form at just the right time with a 3rd straight league win. Both Samantha Hunn and Sophie Gillett scoring a brace against Aylsham one for Gillett from the penalty spot. Bethany turner also celebrating a goal along with a 1st for Gorleston for Kimberley Sherllock. Gorleston winning the game 6-1 close the gap to Sprowston to 4 points, and with 2 games in hand a positive run could yet see them finish 2nd. Sprowston Athletic Ladies also winning at the weekend the 3 points seeing them climb up int the top half of the Division One table. Were taking on Wymondham Town Ladies Reserves, a goal each for Kate Morris and Laura Jenkins helping them secure a 2-0 win. 3 points back from Gorleston they too have 3 games yet to play in a strong position to consolidate a top half finish following promotion this season. 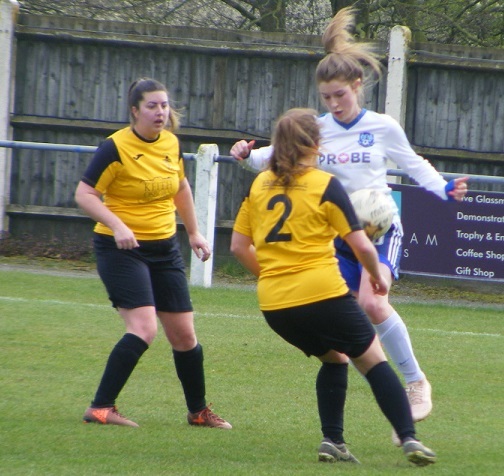 An opening day 0-0 draw for Taverham United Women they hadn’t looked back since the young side winning their next 13 league matches in Norfolk Women’s Division Two to lead the way for much of the season. That run brought to an end this Sunday as they tasted defeat in the league for the first time. At home came up against another side bang on form, Tavern Ladies, 5 straight wins in league and cup the Dereham based side beaten in the reverse fixture with Taverham at the start of the year. A great result away from home with Lucy Kean on the scoresheet for her 9th goal of the season for Tavern along with a brace for Atlanta Griffith who moves to 20 for the campaign. Defeat for the first time Taverham still remain in a very strong position at the top of the table. Fakenham Town Ladies in 2nd spot close the gap to Taverham to 4 points winning at home this Sunday, have two games in hand on the league leaders, Fakenham’s only league defeat this season coming against Taverham who have to come to Clipbush Park yet this season. This Sunday Fakenham were playing host to Horsford Women. Leading 1-0 at half-time Fakenham went on to find the back of the net for 2 more goals in the 2nd half to win the game 3-0. The goals coming from Kayleigh Robb, Jennifer Codman and captain Sian Sands with her 9th goal of the season. 3rd placed Long Stratton Women returned to winning ways at home to bottom side Bulldogs Ladies this Sunday. Samantha Walker bagging herself another hat-trick has 34 goals this season from just 12 appearances for Long Stratton. 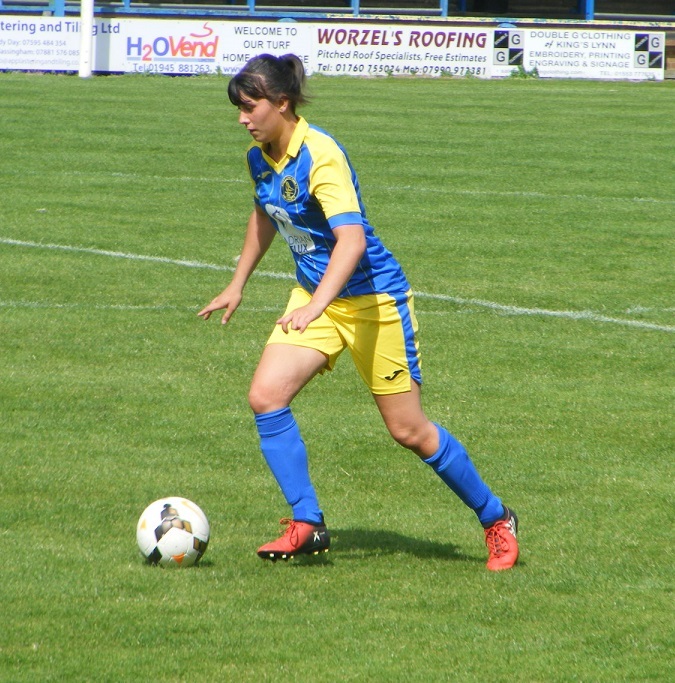 Charlie Head was also on the scoresheet with her 15th of the season the hosts ran out 4-1 winners to claim the 3 points to keep them 6 points clear of 4th placed Tavern who have 2 games in hand. Emma Johnson scoring the goal for Bulldogs her 12th of the season. 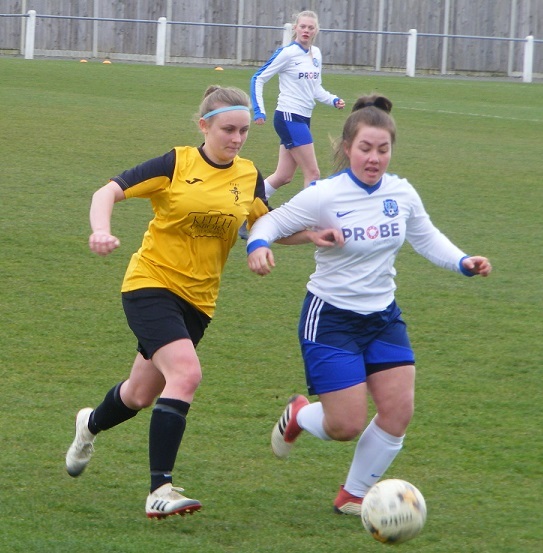 A tight battle in the middle of Division Two with teams jockeying for position Thetford Town Ladies move up a place into sixth overhauling Gorleston Rangers Ladies as the two met at the weekend both on 18 points going into the game at Gorleston. A hat-trick for Melissa Boulton the difference as the Thetford Town’s top scorers goals helped the visitors to a 3-2 win to earn the 3 points. Boulton with 18 goals for the season now. Rachel Adams from the penalty spot and Abbie Pogmore getting the goals for Gorleston Rangers. Up to 7th in the Division Two table are Freethorpe Ladies winning away from home this Sunday against Hockering Ladies who keep battling away despite not being able to field a full team. Freethorpe scoring twice in the first half went on to add another 4 in the 2nd to win the game 6-0. Captain Claire Garner scoring a brace Amy Barber also getting on the scoresheet with first goals for Eden Simmonds, Hayriye Budak and Miranda Park making her first Freethorpe appearance. This entry was posted in Norfolk Women's Division One, Norfolk Women's Division Two, The Round-Up and tagged Norfolk Women's Division One, Norfolk Women's Division Two, The Round-Up on March 27, 2019 by WFEast. The weather a volatile mix on Sunday clubs experiencing a bit of everything, games even abandoned as a result, notably the Division Two clash between Freethorpe Ladies & Gorleston Rangers Ladies. There were plenty of gals around in those fixtures that were completed. 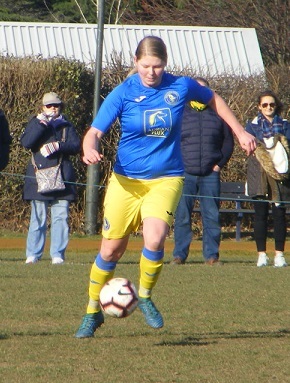 In Division One, Thorpe United Ladies were back in action after clinching the league title a trip to Aylsham Ladies on Sunday. Thorpe have had their share of injuries during the season. Found themselves trailing 3-1 at half-time with Vicky Lubbock, Leanne Symonds and Katrina finding the back of the net for Aylsham. Thorpe far from content to sit back and take it easy in their remaining 2 league matches mounting a spectacular come back 2nd half to win the game 8-3! Ex-Aylsahm player Millie Cursons amongst the goalscorers, so to Laura Hedtke along with braces for 3 players, captain Rebekah Lake scoring her 16th & 17th gals of the season. 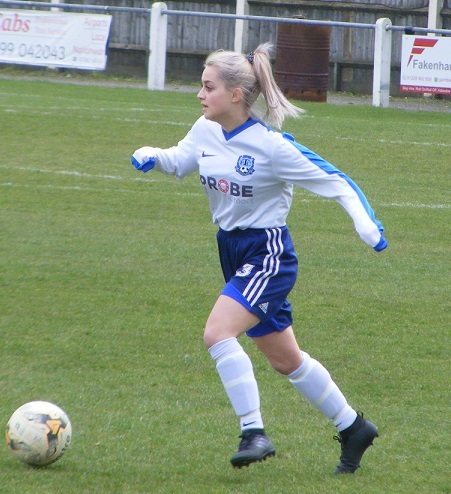 Joanne Hooper having been struggling with a hamstring tear back amongst the goals with first goals for Lisa Webster in just her 2nd appearance for Thorpe United Ladies. The other two league games in Division One, derby matches, 2nd placed side Sprowston Ladies away to Sprowston Athletic Ladies on Sunday. Melissa Belsey with her 9th goal of the season putting Sprowston Athletic 1-0 up at half-time. The points shared in the finish as Sprowston got it back t 1-1 in the 2nd period. The other derby match saw Beccles Town Ladies hosting Bungay Town Ladies this Sunday. Not much in it in the finish, Bungay not taking all their chances goalless at half-time the visitors finally breaking the deadlock early in the 2nd half Imogen McGregor turning the ball in to score her 6th goal of the season. Proving to be the winner the 3 points lifting Bungay off the bottom of the table at Beccles expense. Taverham United Women remain 7 points clear at the top of Norfolk Women’s Division Two with a big win away from home this Sunday. Taking on Thetford Town Ladies the hosts short with just 10 available, that went down to 9 through injury, Taverham strong in attack this season taking full advantage, 5-1 up at half-time went on to win the game 13-1. Rebecca Sutton top scoring in the game for Taverham with 5 goals blazes past 30 goals for the season her tally 34 now. Abbie Walker challenging her hitting a brace on Sunday has 28 herself. There were braces too for Charlotte Hurren and Tiegan Robinson with Hannah Artis and Katie Dunning also getting a goal a piece. Fakenham Town Ladies move back into 2nd spot playing again after almost a month were also away this Sunday a trip to play Hockering Ladies who were short on numbers again with 9 available on Sunday, fought well against Fakenham who eventually ran out 8-0 winners. 4 goals in the game for Holly Davies making her Fakenham debut. A brace for Kayleigh Robb as well as a goal each for Megan Spurrell and Jennifer Codman. Long Stratton Women were in 2nd position going into the weekend fixtures a trip to play Tavern Ladies on Sunday. A lively game played in awful weather at times, the sides drawing 2-2 at half-time Tavern getting the better of their opponents in the 2nd half to emerge with a 6-3 win. A hat-trick for Atlanta Griffith takes her goals to 18 for the season. Top scorer Katie Hart-Copsey scoring another brace now has an incredible 41 goals to her name for Tavern with Nicole Costin also celebrating a goal. Samantha Walker with a brace for Long Stratton with Charlie Head also scoring. In the other league game to bring you from Division Two on Sunday, Bure Valley Wildcats with just the bare 11 available enjoyed a strong first half at home to Horsford Women to lead 4-0 at half time. A further goal added 2nd half Bure Valley recording a 5-0 win Charlie Cooper shooting past the keeper for 4 of those goals has 25 to her name for the season now. Carrie Last with the other goal her 11th of the campaign. This entry was posted in Norfolk Women's Division One, Norfolk Women's Division Two, The Round-Up and tagged Norfolk Women's Division One, Norfolk Women's Division Two, The Round-Up on March 20, 2019 by WFEast. 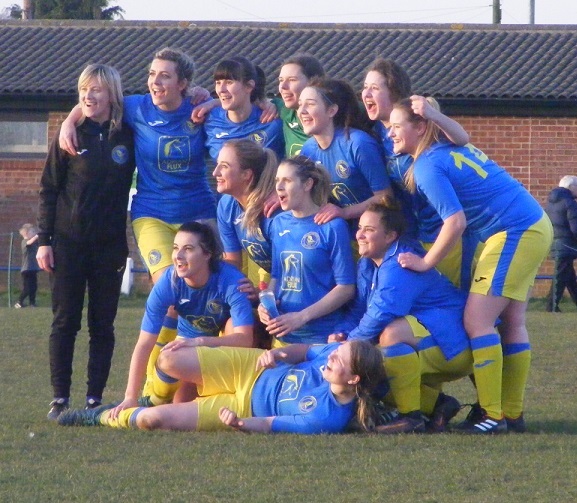 Thorpe United Ladies claim the first honours of the season as they were crowned Norfolk Women’s Division One Champions on Sunday. A 9 point lead at the top of the table going into the weekend have lost just the once in the league from 11 played. The introduction of youth stepping up into the 1st team rejuvenating the squad have led from start to finish. Injuries hampering progress in the cup competitions recently Thorpe went into this Sunday’s home game knowing a positive result would clinch the title. Were taking on Sprowston Athletic Ladies who with games in hand on the leaders remained the only side who could catch them. Sprowston Athletic unlucky in the finish having gotten themselves into a two goal lead with Katie Fray and Keri Boorman on the scoresheet, Thorpe coming back with 3 late goals to claim the win. Captain and top scorers Rebekah Lake on target for her 15th goal of the season. Laura Hedtke scoring for the 9th time with Alice Smith making her 1st start also celebrating a goal. Congratulations to Thorpe United Ladies on your title success. Champions! One more game took place in Norfolk Women’s Division One on Sunday with 4th placed Gorleston Ladies travelling to 5th placed Wymondham Town Ladies Reserves. A big win for Gorleston takes them up to 3rd in the table ahead of Aylsham Ladies on goal difference. Mary Croft trebling her tally for the season finding the back of the net for 4 goals in the match. A brace too for Sophie Gillett, with Bethany Turner also getting a goal in a 7-0 victory for the visitors. A reply for Beccles Town Ladies and Bulldogs Ladies in the quarter finals of the Norfolk Ladies League Plate after the original tie was abandoned after 76 minutes with Beccles leading 4-0 due to a serious injury. Rearranged for this weekend an away trip to Aylsham Ladies awaiting the winner. Beccles getting players back from injury after a long spell without a game Bulldogs Ladies short on numbers. Beccles running out convincing winners to reach the last 4 of the competition, three players on target for a brace, Rosie Cook, Megan Vincent and the first goals of the season for Elisha Maher. Darcie Keiley also scoring her 1st goal, with Emily Coe and Francesca Heaney getting a goal each in a 9-0 win. The fixture list virtually wiped out in Norfolk Women’s Division Two on Sunday due to the weather. Only one game surviving and that thanks to a reversal of fixture with Thetford Town Ladies down to visit Freethorpe Ladies becoming the home side. 7th versus 8th in the table, Thetford beginning to find their feet in women’s football recording their 6th win of the season. 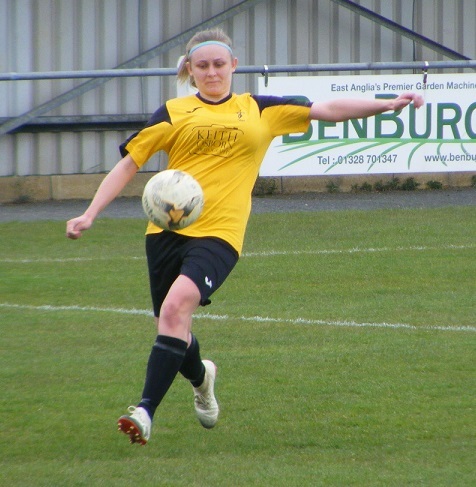 Melissa Boulton hitting a brace on Sunday moves onto 15 goals this season for Thetford. Shannon Richardson scoring too has 7 for the season with Rebecca White getting a goal too in only her 2nd game for Thetford in a 4-1 win. Kiera Squires the goalscorer for Freethorpe. This entry was posted in Norfolk Ladies Plate, Norfolk Women's Division One, Norfolk Women's Division Two, The Round-Up and tagged Norfolk Ladies League Plate, Norfolk Women's Division One, Norfolk Women's Division Two, The Round-Up on March 12, 2019 by WFEast. Semi-final weekend for the Norfolk Women’s County Cup a strong line-up in the last four with the huge incentive of Carrow Road waiting for the winners the final of the women’s competition being held at the home of Norwich City FC. No side winning to lay down both games couldn’t be sorted in the allocated 90 minutes. It was to one of these semi-finals Women’s Football East headed this Sunday to the game between Thorpe United Ladies & King’s Lynn Town Ladies. 4 County Cup final appearances in a row for Thorpe United including back to back successes in recent season’s the underdogs being the lowest ranked side. That said their new side with a good blend of youth and experience are runaway leaders in Norfolk Women’s Division One. King’s Lynn Town Ladies playing in the league above were looking to reach the County Cup final for the 1st time. Thorpe with a depleted squad a few missing some on the field recovering from injury. Started well with captain Rebekah Lake a threat up top. King’s Lynn were to open the scoring the ball struck well from outside the area by Tiffany Forshaw on the hour to make it 1-0. A narrow lead for King’s Lynn at the break the 2nd half they started to grow in dominance creating chances but failing to find the back of the net to put the tie to bed. The game entering the final 10 minutes Thorpe with a free-kick outside the area was cleared out to Sharnie Boast on the left inside the box struck it well racing through the crowded six yard box to nestle in the back of the net. 1-1 at the final whistle extra-time to be played. King’s Lynn striking early to retake the lead the ball crossed into the area for Forshaw to head down from six yards to score her 2nd of the game. Good work from Jodie Hopkins on the right supported by captain Becky Russell brought a 3rd goal the ball across the face of goal missed at the near post running on for Forshaw to tap in and complete her hat-trick. King’s Lynn 3-1 with 15 more minutes of extra-time left. Thorpe were never out of it a free-kick struck well from outside the box by Laura Hedtke setting up a nervous finish but running the ball into the corner King’s Lynn held on and were ecstatic at the final whistle as they booked their place at Carrow Road. 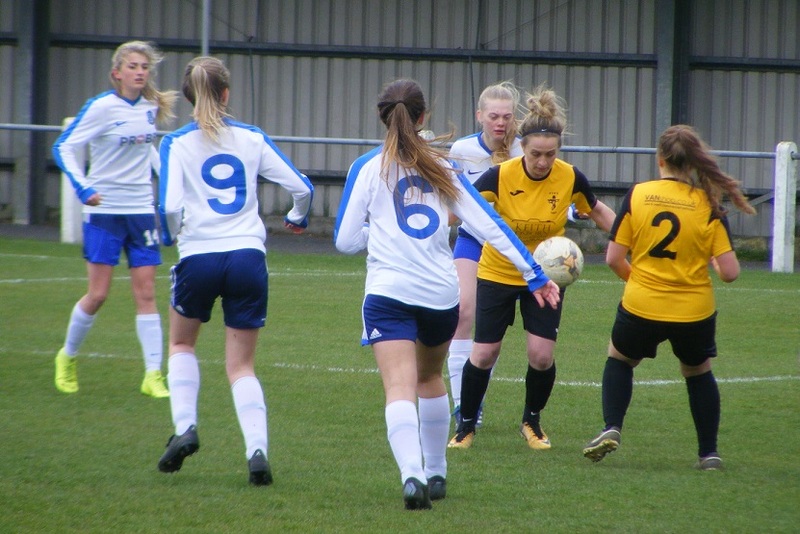 No less dramatic in the other Norfolk Women’s County Cup semi-final as Acle United Women took on Wymondham Town Ladies in a repeat of last season’s final. Close rivals always a closely fought contest between the sides both in the ERWFL Premier Division. Both have lifted the County Cup, Wymondham the holders last season’s winners 3-2 over Acle looking to make it 3 finals in a row. League encounters don’t give much away Acle winning 1-0 at Wymondham back in October. Wymondham returned the favour winning 1-0 at Acle 3 weeks ago. The game started off at tight affair little penalty box action, the opening goal coming as the game closed in on the half hour Wymondham awarded a free-kick in a dangerous position 25 yards out, Mollie O’Callaghan the taker her shot judged to have crossed line despite Acle’s attempts to clear. 5 minutes to go in the first half and it was Acle’s turn to score from a free-kick Amber Rowland finding the top corner to make it 1-1. Wymondham were soon back in front getting down the other end won a penalty. O’Callaghan stepping up to send the ball in for her 2nd of the game. 2-1 the lead at half-time. Mid-way through the 2nd half and Acle levelled the scores up once again winning a penalty themselves Rowland like O’Callaghan sending the ball past the keeper to make it 2-2. Acle pressed for a winning goal Wymondham keeping them at bay the game ending all square headed int extra-time. A cagey period of extra play Laura Nicholls broke through to send the ball into the back of the net to put Wymondham ahead for the 3rd time in the game, but with 3 minutes remaining Acle equalised for a 3rd time. Broghan Scully sending the ball in from the free-kick. The game heading to penalties the shootout seeing more drama, Acle seeing one strike the post, Summer Ward scored the decisive spot kick for Wymondham to send them into their 3rd successive final. Wymondham winning on penalties 5-4. The Final to be played at Carrow Road, I can hardly wait! Scheduled for Sunday 28th April with a 3:30pm kick-off. One game in Norfolk Women’s Division One this Sunday with 2nd placed Sprowston Ladies travelling to the coast to play Gorleston FC Ladies on Sunday. A 1-0 lead for the visitors in the 1st half Sprowston went on to have the better of the 2nd half to score a further 4 goals and win 5-0 to open up a 3 point gap over Aylsham Ladies in 3rd. Victoria Leyer hitting another brace takes her tally to 21 goals for the season from 10 appearances. Their were goals too for Amee Kennett, Georgina Belton and captain Abby Hutchin. One outstanding tie left to play in the 2nd Round of the Norfolk Ladies League Plate competition saw another Sprowston side travelling to Gorleston on Sunday with Sprowston Athletic Ladies taking on Division Two side Gorleston Rangers Ladies. The higher league side running out comfortable winners in the finish to reach the quarter finals. 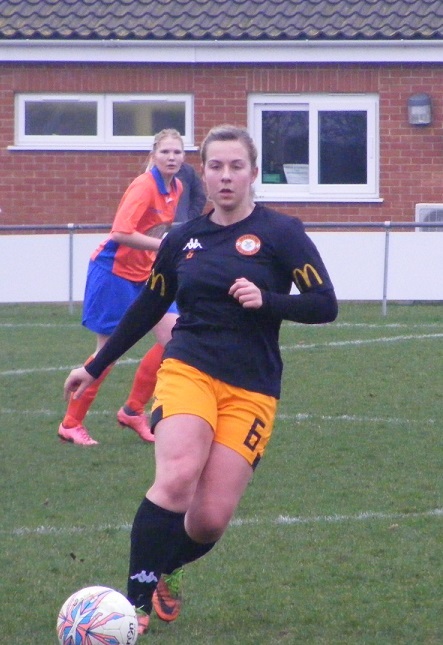 Sprowston Athletic wining the game 61 had 6 different goalscorers on the scoresheet with both Melissa Belsey and Rachel Bussey netting for the 5th time this season. Goals too for Olivia Leggett, Katie Fray and Laura Jenkins with Keri Boorman on target for her 1st of the campaign. An away trip to Division Two side Bure Valley Wildcats Ladies this coming Sunday in the quarter final. Rachel Adams with the goal for Gorleston Rangers. Three matches played in Norfolk Women’s Division Two this Sunday. Long Stratton Women taking advantage of Fakenham Town Ladies not having a game to climb above them into 2nd spot in the table with their 5 successive league win. Were on the road this Sunday taking on Freethorpe Ladies. A brace from Beth Stratton taking her to 12 for the season along with a 27th goal of the season for Samantha Walker seeing the visiting side win the game 3-0. A series of postponements see Tavern Ladies with games in hand in Division Two and should they win those games will be in amongst the top 4 sides themselves. A scoring plenty of goals too. Were away to Bure Valley Wildcats Ladies this Sunday. 4-1 up at half-time the score repeated 2nd half to see Tavern climb up to 6th with an 8-2 victory. Katie Hart-Copsey well in front in the goal scoring charts hit 5 into the back of the net this weekend taking her tally to an incredible 35 goals from 11 appearances. Atlanta Griffith with a goal to against Bure Valley has 15 for the season with Lucy Lincoln and Meganne Smith with her 1st goal of the season also scoring. 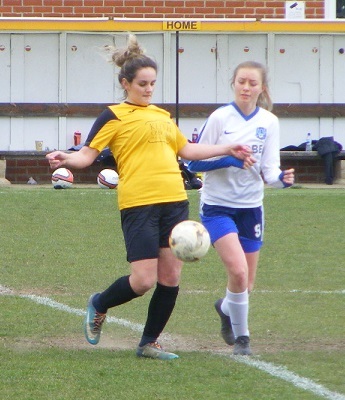 Hockering Ladies were once again short on numbers as they entertained Horsford Women at home this Sunday in Division Two. Horsford winning for the 3rd time this season to move further clear of the bottom pair. The winning score 6-2. 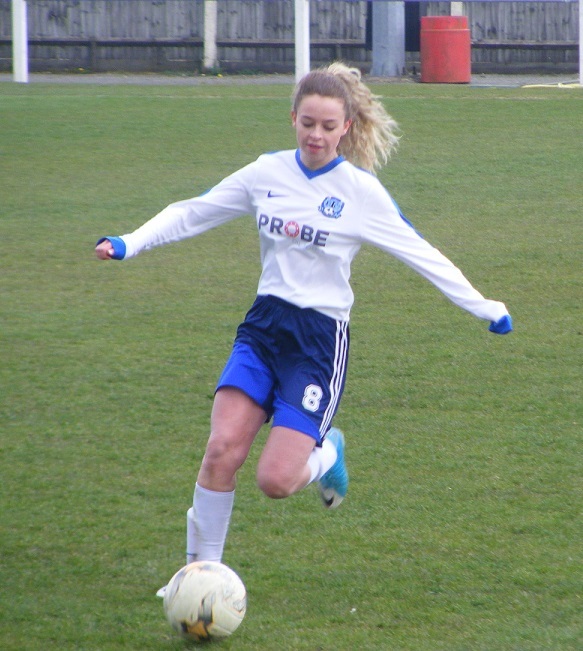 Laura Hudson was on target for 3 goals her 1st for the club in just her 2nd appearance. Jade Dodds too celebrating her 1st goals for Horsford netting a brace with Tanya Kirton also on the scoresheet for her 3rd of the season. Amy Bambridge scoring both the goals for Hockering. This entry was posted in Norfolk Ladies Plate, Norfolk Women's County Cup, Norfolk Women's Division One, Norfolk Women's Division Two, The Round-Up and tagged Norfolk Ladies League Plate, Norfolk Women's County Cup, Norfolk Women's Division One, Norfolk Women's Division Two, The Round-Up on February 20, 2019 by WFEast. It doesn’t happen very often but this time of year the weather plays it’s part to hit the fixtures and sometimes it’s simply easiest to combine all or some of the weekends Round-Up’s into a collective post. This Sunday there were just two fixtures played in Norfolk, Suffolk and 3 in Beds & Herts so they get to share this edition. Water logged pitches being the theme. Just three games scheduled in Norfolk anyway those in Division Two that was reduced to two with the rain seeing the match between Hockering Ladies & Tavern Ladies postponed. League leaders Taverham United Women were away on Sunday there opponents Horsford Women. Taverham unbeaten winning their last 10 league games in a row are scoring plenty of goals with Rebecca Sutton and Abbie Walker slugging it out for top goal scorer. Walker getting herself another hat-trick this Sunday, Sutton waded in with 5 goals, a total of 55 goals between them now, Sutton on 29, Walker on 26 both with 14 appearances. A hat-trick too for Maya Lawlor on Sunday takes her into double figures for the season for Taverham. 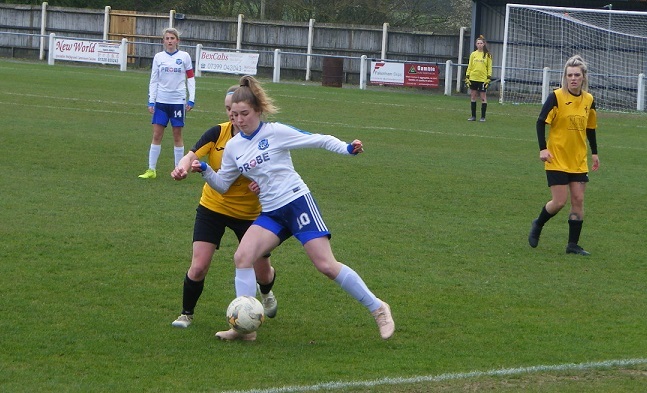 Charlotte Hurren and Teigan Robinson also getting a goal each as Taverham extend their lead at the top of the Division Two table with a 13-0 to 7 points over Fakenham Town Ladies who do have two matches in hand. 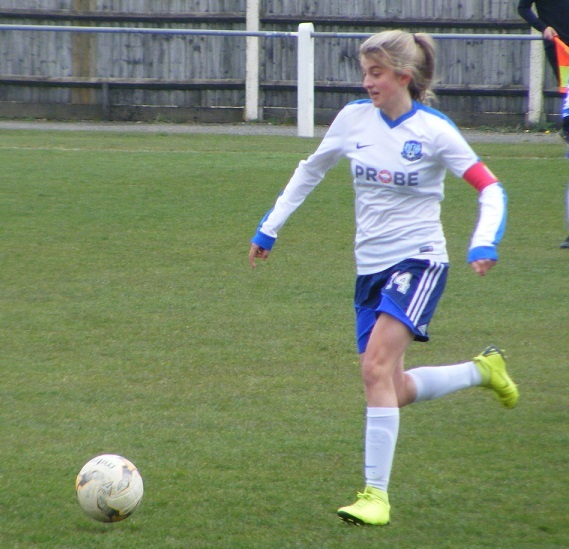 In the other match played in Division Two this Sunday, Bulldogs Ladies fresh from their 1st win of the season last Sunday travelled to the East coast to player Gorleston Rangers Ladies, in 5th position. A goal in each half from Abigail Bell seeing Gorleston Rangers record a 2-0 win their 6th of the season to take them level on points with 4th placed Bure Valley Wildcats Ladies. 4 matches scheduled for the Suffolk Women’s Division Division this Sunday including the two League Cup semi-finals, both of those games postponed will be replayed on Sun 24th February instead. Those ties featuring the top 4 in the league itself. Two league games did get played and it was another positive result for Woodbridge Town Ladies their 3rd straight league win to help them consolidate their 5th placed position in the Suffolk Women’s Division. A reverse of last Sunday’s fixture were away to Chantry Grasshoppers Ladies then securing a comfortable 5-0 win. A different story at Chantry Grasshoppers the sides all square at 1-1 at half-time Woodbridge scoring again in the 2nd half to win the game 2-1. Kiera Hines and Kirsten Spooner with her first Woodbridge goal the scorers for the visiting side. Charlotte Archer on target in the first half for Chantry Grasshoppers. A high scoring game between University of Suffolk Women and Walsham Le Willows on Sunday. Walsham travelling to the bottom placed side with just the 10 players available. A mixed bag of form for Walsham this season, hasn’t stopped top scorer Laura Brame from finding the back of the net more often than not scored another hat-trick on Sunday to move onto 20 for the season. Also scoring a hat-trick for Walsham on Sunday was Emma Marie Baker her first goals for the side too n just her 2nd appearance. Lisa Pratt and Kirsty Pollard both getting a goal a piece too as Walsham ran out 8-3 winners in the game taking them back into 6th spot. It was a limited league programme in the Beds & Herts Women’s Division this Sunday anyway with cup action taking president. One game taking place in Division One saw defending champions St Albans Ladies at home to title chasing Hemel Hempstead Town Ladies. Sophie Hull scoring in the 13th minute giving St Albans an early lead. The hosts working hard defensively to keep their opponents at bay were unlucky to concede right at the death, Hemel Hempstead’s top scorer Natasha McConville striking late in the game to secure a point with her 18th goal of the season. That only adds to the intrigue at the top of the league with there now being a 3 way tie at the top with Northwood Ladies, Hemel Hempstead and Welwyn Pegasus Sapphires all on 19 points! One game also in Division Two this Sunday and that sees new leaders as Hitchin Belles replace local rivals Hitchin Town at the top for the 1st time this season. Hitchin Belles winning for the 9th time this season on the road on Sunday taking in Bedford Ladies Development. Have a potent attack with Katie White keeping the lead in the goal scoring charts netting a hat-trick on Sunday taking her onto 17 for the season. Charlotte Peters has 14 to her name claiming a brace at the weekend, Amy Jack and Keira How also amongst the goals this season both on target with their 13th and 9th goals respectfully Hitchin Belles winning 7-1. For the 2nd Sunday in a row the weather played havoc with The Chris Renshaw Cup competition the rescheduled cup ties once again hit by the wet conditions the day before. 5 2nd Round ties set for this Sunday in the end just the one survived that saw Division Three high flyers Woburn & Wavendon Lionesses at home to Sherrardswood Ladies struggling for form in Division One this season. A goal from Charlotte Bedford along with a penalty struck home by Victoria Harrold seeing Woburn & Wavendon Lionesses advance to the quarter finals. This entry was posted in Beds & Herts Women's Division One, Beds & Herts Women's League Cup, Norfolk Women's Division Two, Suffolk Women's Division, The Chris Renshaw Trophy, The Round-Up and tagged Beds and Herts Women's Division One, Beds and Herts Women's Division Two, Norfolk Women's Division Two, Suffolk Women's Division, The Chris Renshaw Trophy, The Round-Up on February 13, 2019 by WFEast.